Whilst most of the teams will be preparing a substantial upgrade for when F1 returns after the summer break, there were some noteworthy changes to some of the cars in Hungary. In this week’s Tech Highlights we will look at upgrades from McLaren, Williams, Red Bull and Mercedes, plus a look into the reasons behind Sergio Perez’s rear suspension failure during FP1 and indeed Nico Hulkenberg’s front wing failure during the race. Williams moved part of their intended upgrade for Spa forwards slightly, allowing Valtteri Bottas to run the only new front wing available for the weekend. The remaining parts will be brought after the summer break for both drivers, and judging by the new wing the changes could be quite widespread over the rest of the car. Whilst the cascade elements remain the same as its predecessor, the flaps, endplates and outboard elements have been heavily reworked to generate new aerostructures over the rest of the car. 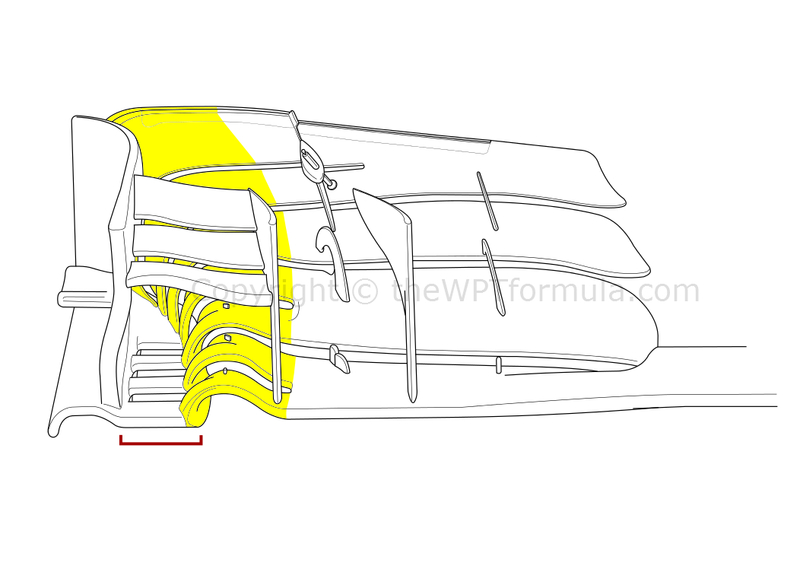 Starting with the upper flaps: they make look similar in shape, but their positioning has been changed to finetune the Y250 vortex that runs in parallel with the front of the car before veering off around the sidepod undercut. The flaps are now slightly twisted further forwards, which is similar to what Mercedes and Red Bull are doing. This reshapes the airflow over the front suspension elements, too. Outboard, the seven elements (highlighted) now form a more aggressively arched tunnel to form a strong vortex around the front tyre. 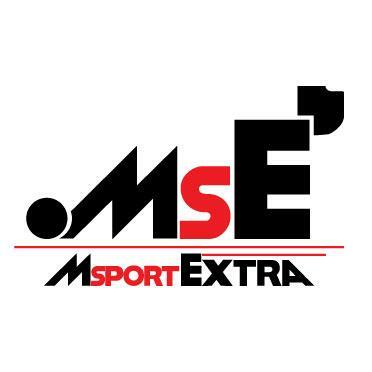 Mercedes are leading development in this area, whilst Ferrari – like Williams – have gone for a less dramatic shape. The arched elements now begin further inboard and further away from the endplate, as indicated by the red marker. As a result the air expands rapidly outwards as it approaches to the back of the wing, which can be hard to control properly. To help this, three of the leading elements continue to run along the footplate of the wing, forming three distinctive slots. This, along with the slot gaps that separate the other wing elements, controls the formation of the vortex to produce more consistent front downforce. To suit the new wing profile, the endplate has arguably a more basic shape, but is still designed to push flow around the front tyre. More small vortex generators have been dotted along the wing ahead of some of the slot gaps, plus the upper flap angle adjuster has been tweaked to benefit the new profile. Once the team that everyone copied, even the mighty Red Bull have slowly resorted to taking leaf after leaf out of the Mercedes book, including their front wing and rear wing endplate design. For Hungary the ‘Bulls replicated the Silver Arrows nose camera pods, much like Ferrari have done. The pods now stand on tall, thin stalks that act as miniature turning vanes, whilst the blockage that the pods caused have been shifted higher and in front of the upper front suspension wishbone. This should help improve the aerodynamic efficiency of the RB11 by a tiny bit, by shifting the wake the pods generate to a more ideal location. The team have also resorted back to the blown front axle, which has been missing for the past few races. I think that this solution works well for mid-speed corners where the aero loads a lower, which reduces the outwash of the front wing. The blown axles generate more outwash around the front tyre, so whilst it might not be an efficient method of producing downforce it is effective at a slower speed tracks. A double points finish may have come as a surprise on Sunday, but McLaren Honda have made progress on both the power unit and chassis fronts lately but perhaps haven’t been able to show it due to circumstances mostly out of their control. Further aerodynamic tweaks were evident over the weekend which complete the overall upgrade to the MP4-30 that started back in May, including the short nose. The final pieces of the upgrade include further shrink-wrapped sidepods, additional aero devices above the diffuser and new mirrors/cockpit aero tweaks. Starting with the mirrors highlighted above, these follow what Mercedes have been doing since the start of the season by using the mirror blade and an additional, upturned vane to control airflow over the sidepod. The vane acts as both a vortex generator – the vertical part – and a guide vane – the small horizontal section – by using the flow passing around the mirror blade. This minimises the disruption that the mirrors cause and actually turns it into a positive aero effect by encouraging air down the sidepod towards the top of the diffuser. The sidepods now feature a small blister thanks to the extra effort put into hugging the McLaren’s internals – the blister is made to clear the back of the Honda power unit. This both reduces drag and improves downforce, as more air is allowed to make its way to the top of the diffuser. Speaking of the diffuser, the MP4-30 now has two Gurney flaps above its top edge, one stacked above the other. 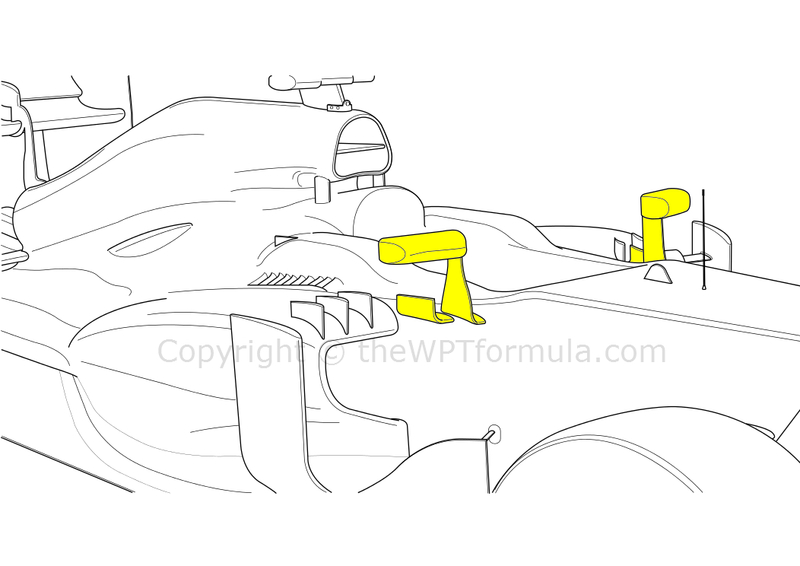 Around the rear crash structure is a newly designed flickup element, too, which works with the Gurney flaps to link the diffuser and rear wing together via the upwash effect. These changes are minimal, but will improve rear stability and consistency rather than boost overall rear downforce. Finally, the front wing received yet more detail changes to the upper flaps including scalloped trailing edges to improve flow over and around the under-wing fences. Big budget teams such as McLaren can afford to continuously make these tiny tweaks, but imagine the amount of spare iterations of wing that are amounting! Although it wasn’t raced, a new monkey seat winglet was installed on the W06 during Friday practice. Mercedes have produced some extravagant Y100 winglets in the past but this new one is very simplistic and resembles that seen on the Williams in recent years. Consisting of just one shallow element, it is set at an angle with the two mounting pylons angled forward and attaching to the top of the rear crash structure by the engine cover’s edge. There is still a lot of experimentation in this region of the car amongst all the teams, and this is Mercedes’s third iteration of the device since 2014. Having introduced a large upgrade at the previous round in Silverstone, Force India will be more than a little disappointed to see two of those fail at the Hungaroring – the rear suspension and the front wing. On Friday, Sergio Perez’s front lower arm on the rear wishbone fractured, pitching him into a spin and produced a dramatic crash. The fractures were caused by the excessive use of the kerbs, which are a factor in getting a good laptime around this circuit. The vibrations were so severe that the structural part of the suspension failed – the wishbones consist of an outer layer that dictates how air passes around them and a structural inner core for load bearing. After abandoning FP2 to find out how to fix the problem, a huge effort was made back at their factory in the UK to redesign, test and manufacture the new wishbones overnight before delivering them to Hungary ready for Saturday. That’s an incredible achievement and it just shows how F1 teams are ready to react to such issues, even for a team with a slightly low end budget. Nico Hulkenberg’s front wing failure during the race was also caused due to the same kerb-related problem, resulting in the lower parts of the mounting pylons to give way under maximum aerodynamic load. Force India were not the only team to be caught out by the kerb vibrations, as Ferrari’s Kimi Raikkonen had a nose camera pod fall off midway through the race due to the same thing.